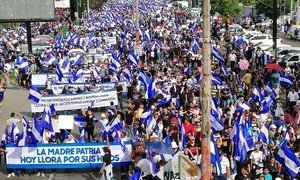 Protesters in Managua take part in a march to demand an end to violence in Nicaragua. The banner reads "This struggle is non-violent" in Spanish. Following weeks of civil unrest in Nicaragua, a group of 11 UN independent human rights experts urged the Government on Thursday to stop the violent repression of protestors, which has left at least 317 people dead and 1,830 injured, stressing that "no one should be detained for the exercise of their human rights”. Street protests against social security reforms began in April and were immediately violently suppressed by security forces and groups affiliated with the governing party. One hundred days later, the protests have “decreased in number and intensity following the removal of roadblocks by the Government” according to the Office of the UN High Commissioner for Human Rights (OHCHR), but the UN experts said that dissident voices - ranging from rural community leaders and students, to journalists and Catholic Church leaders – are still being subjected to intimidation, threats, collective detention. The United Nations Secretary-General has called on the Nicaraguan Government to end violence against demonstrators which has cost an estimated 280 lives, and begin a national “political dialogue” to end the crisis which has gripped the country for nearly three months. 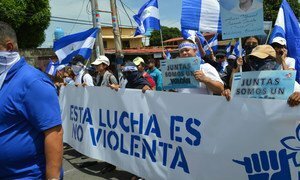 The Nicaraguan authorities should “take real steps” to prevent further loss of life in the country amid ongoing protests and violent repression by pro-Government “armed elements”, the UN’s top human rights official said on Thursday.